Jim Lampley was born on the 8th April 1949, in Hendersonville, North Carolina USA, and is a sportscaster, news anchor, movie producer, and restaurant owner, best known for his work as an Olympic Games reporter and HBO World Championship Boxing co-host and anchor. 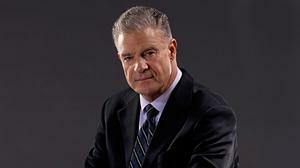 Thanks to his journalistic skills, Lampley has significantly increased his net worth. His career has been active since 1974. Have you ever wondered how rich Jim Lampley is, as of mid-2016? According to authoritative sources, it has been estimated that Jim’s net worth is as high as $16 million. In addition to being a successful journalist, Lampley also owns a production company and two restaurants in Utah, which have improved his wealth. James Lampley was raised in Hendersonville, and his mother encouraged him into sports in memory of his father who died when Jim was five. Lampley moved to Miami, Florida, and later went to the University of North Carolina from where he graduated in 1971 with a degree in English, and also earned a Masters in Mass Communications in 1974. The ABC talent hunters approached Langley while at college in 1974, and he subsequently covered events like Major League Baseball and college basketball games, and later the 1977 Monon Bell game between DePauw University and Wabash College. Jim also did the 1986 and 1987 Indianapolis 500 car races, and five Summer Olympic Games (1976-2008). Jim worked as a co-host of ABC’s the United States Football League from 1983 to 1985, which certainly added a lot to his net worth, while in the meantime he even interviewed the then President Ronald Reagan in 1984. In 1985, Langley covered Super Bowl XIX, along with the legendary Al Michaels; it was the debut Super Bowl that ABC broadcast on TV, and increased further his net worth. After more than a decade at the ABC, Langley moved to CBS in 1987 where he worked as a co-anchor and correspondent. In the same year, he also joined HBO, covering Wimbledon and boxing; he is one of the best-known journalists to cover HBO. He has broadcast such famous bouts as Julio César Chávez vs. Meldrick Taylor, James “Buster” Douglas vs. Mike Tyson, Riddick Bowe vs. Andrew Golota, and George Foreman vs. Michael Moorer, which increased his net worth by a large margin. Lampley’s production company Crystal Spring Productions produced numerous movies including mockumentary “Welcome to Hollywood” (2000) starring Tony Markes and Adam Rifkin. He has also appeared several films and series such as “Blades of Glory” (2007) with Will Ferrell and Jon Heder, “Balls of Fury” (2007) starring Dan Fogler, George Lopez, Christopher Walken, and Maggie Q, and in an episode of “Everybody Hates Chris” (2007), which successes have also added a considerable amount to his overall wealth. Regarding his personal life, Jim Lampley was married to news anchor Bree Walker(1990-99) with whom he has a son, Aaron. Lampley married event planner Debra Schuss in 2012. While was in a relationship with his former girlfriend Candice Sanders in 2007, Jim was arrested for domestic abuse, and handed a restraining order which he violated, and was sentenced to three years on probation, 40 hours community service, and domestic violence counselling. His former wife Bree Walker said that he never could physically abuse anybody. Jim resides in Del Mar, California with his son, and also has three daughters Brooke, Victoria and Andrea. 1 Inducted into the International Boxing Hall of Fame in 2015 in the Observer category. 3 Father of Brooke Mallis Lampley (born in 1980) and father-in-law of Christopher Papagianis (born in 1980). 4 He is a longtime boxing commentator and works for HBO Sports. 5 He and ex-wife, Bree Walker, are partners in Crystal Springs Productions. As of June 3, 2004, they revealed on Larry King Live (1985) that they had plans to remarry. However, they remain divorced as of the spring of 2007. 6 He has two children with former TV anchor Bree Walker - a son, Aaron, and a daughter, Andrea.